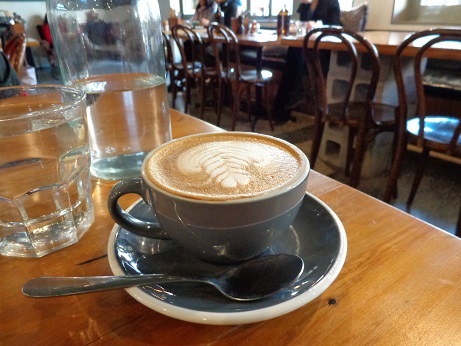 Coffee is popular and prevalent in New Zealand as well as Japan. But Japanese coffee culture seems to be slightly different from that of New Zealand. To me, it seems that flatwhite is particularly popular in New Zealand. In Japan, on the other hands, tasty filter coffee served at some sort of distinguished cafes would be well-received (and reasonably priced filter coffee served at franchised cafes is also quite popular!). At home, New Zealand people often use a plunger to make coffee. I do not think Japanese people do so. By the way, the photo above was taken in a cafe in Hamilton. Of course, it’s a cup of flatwhite. Yum!